The idea behind Tempest comes from this deep connection I feel to the ocean. 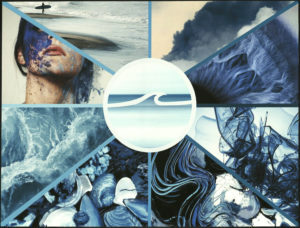 This collection is a physical representation of the energy and movement of the sea. As the looks progress, the color becomes deeper and texture grows through each look. To get a range of monochromatic blues, all the fabrics will be dyed and the textures will be implemented through fabric manipulation and the fabrics themselves. 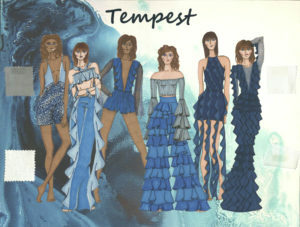 Texture will also be added through surface design techniques such as beading to incorporate other elements of the ocean to the designs.